Runbooster is a Trojan, and like any other similar threats, it is difficult to notice it on the system. However, our researchers found out that in some cases the malware may display suspicious advertising content. Thus, if you notice an increase of advertisements unrelated to your used keywords or leading you to potentially harmful websites, it might be the best time to check the system and see if there are infections on it. If you happen to detect Runbooster, you could try to eliminate it manually by following the instructions we added below this text. For less experienced users it would be advisable to acquire a reliable antimalware tool that could help you delete the threat more easily. In addition, we recommend reading the article as it will provide you with more information about this malicious program. Users might encounter Runbooster by downloading data from malicious websites or installing potentially dangerous applications. It means there are more chances to face such infections if you occasionally install suspicious freeware, updates, and so on. This particular malware may show doubtful advertising content so it is possible it could settle on the system with adware or other applications supported by advertising. As a result, we would advise users to be extra cautious with freeware, especially if you find it promoted on unreliable file-sharing web pages or pop-up ads. Without a trustworthy antimalware tool it might be difficult to identify these potentially dangerous programs, so we would advise you consider getting a legitimate security tool to strengthen the computer’s security. 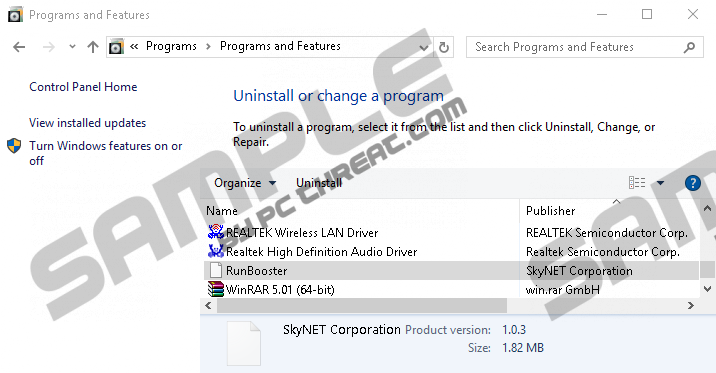 To see if Runbooster managed to enter the system, users should check the following directories %PROGRAMFILES%, %PROGRAMFILES(x86)%, %WINDIR%\System32\Tasks. If the malware settled on the PC, these locations should contain files and folders related to the Trojan. In some cases, the threat may even appear on the Control Panel’s Programs and Features list, so it might be possible to uninstall it, although we cannot say if it would remove the malicious program entirely. For those who wonder how harmful Runbooster could be, we can say that there are two main risks. The first one is related to the computer’s security and its performance. As we mentioned above the malware might be showing potentially dangerous advertisements that could encourage you to download other malicious software or lead you to harmful web pages. Plus, this infection might be capable of adding suspicious applications on its own without asking the user. Such actions may put your computer and files on it in danger as well as lower the system's performance. The other risk is related to the user’s personal information, for example, details about his banking account, email or social media passwords, computer’s login information, and so on. Apparently, the Trojan could be capable of stealing such data while recording the user’s keystrokes. Our researchers say the malicious application could even allow its creators to access other sensitive data or files placed on the PC. As you realize, to avoid the mentioned risks it is better to get rid of this malicious program as soon as possible. Firstly, we would recommend using a reliable antimalware tool since it can help users detect and erase the Trojan automatically. Moreover, such software could identify even other potentially dangerous applications that might have been installed together with the malware or with its help. Besides cleaning the system, the tool could also continue to guard the system against threats if you simply keep it updated. Nonetheless, if you believe you are fully capable of removing the infection manually as well as eliminating other possible threats, we can offer you the deletion instructions placed at the end of this page. They will guide users to the directories where the malicious application should have placed its files and folders. The provided steps will also instruct how to erase such data. If there are any questions related to the Trojan, you could ask them by leaving a comment below or contact us through social media. Locate a folder named as RunBooster. Right-click a file named as RunBoosterUpdateTask and select Delete. Quick & tested solution for Runbooster removal.